Rab Neutrino Pro Jacket. "If you're taking on the likes of Toubkal, or planning alpine ascents, the Neutrino Pro is the lightweight down-filled mountain jacket that will take you from basecamp to the summit and back. A technical mountain jacket suitable for winter alpine conditions up to 4000m, the Neutrino Pro uses weather-resistant Pertex Quantum Pro outer fabric deals with spindrift and snow. 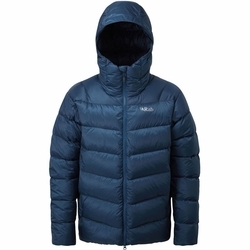 800 fill power of ethically-sourced hydrophobic down locks in the warmth. The helmet-compatible down filled hood features a wired peak, and concealed adjusters. A two-way front zip with synthetic insulated baffle behind maximises warmth, and an internal zipped security pocket keeps the essentials safe.